I have fond memories of the smell of my mom's apples baking. Yes, my fond memories are of the smell, not the taste. You see, my mom occasionally joined Weight Watchers and baked apples was an approved dessert. But Weight Watcher's baked apples didn't taste like Dorie Greenspan's baked apples; maybe because they were not stuffed with dried fruits and nuts and covered with a big pat of BUTTER. 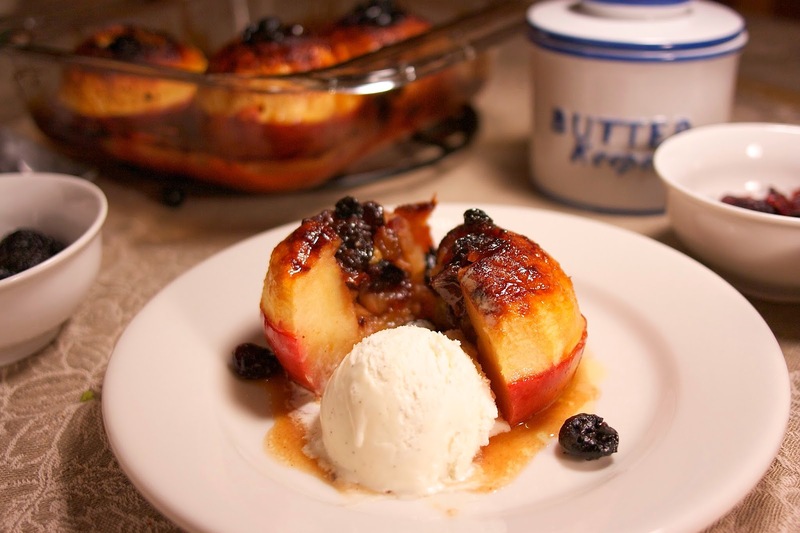 No the baked apples of my youth are no comparison to this exceptional baked apple recipe. This recipe isn't complicated. You just hollow out your apples, being careful not to go through the bottom. I used a melon baller to clean out the center after I made the initial cut. It worked really well. After you core the apples, you remove the peels half way down the apple and make a light cut around the apple at this point, so it won't explode! 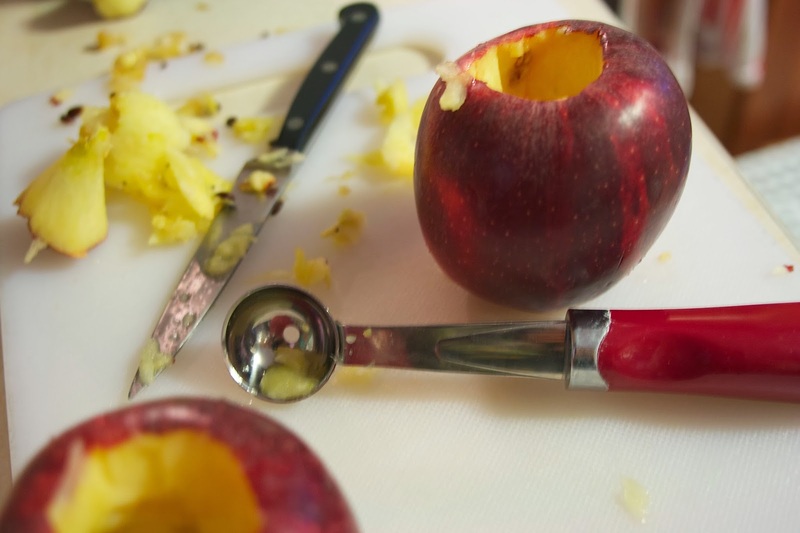 Now I thought this half way peeling thing was just a fancy French trick to complicate the simplicity of baked apples, but when you are eating the apple, it is wonderful to just be able to spoon the apple out without the peel to fight. Dorie instructed us to put the apple peels into the baking dish. I'm not sure if this added any flavor or not? Because I am not usually a fan of sweet fruit desserts I made a mixture of mostly tart dried fruit: cherries, currants, and a few golden raisins. I added walnuts, cinnamon and honey to the mixture and stuffed the apples with this delicious concoction. And yes, I topped each apple with a pat of butter. Now Dorie suggested using apple cider or water as the sauce. I had bought apple cider specifically for this dessert, but I forgot to label it: "DO NOT DRINK, FOR COOKING" so when I looked in the fridge it was gone, consumed by my kids. I did have orange juice, so I used that instead,... and I think the citrus note was wonderful… some of the best recipes come out of a need to substitute. I baked the apples at 350 for what seemed like an eternity. Every 20 minutes I basted them with the orange juice sauce until they were "spoon tender" as Dorie described. I think it took about 75 minutes, but it was worth it. The baked apples really sound delicious. I am so looking forward to tonight's dessert. Enjoy they are truly wonderful. I must say that yours looks fantastic!!! If you haven't tried them with dried fruits and nuts I highly recommend it. The orange juice was really good too. With all the ways we have for treating apples, I am pretty sure this is the first time I have baked and stuffed a whole apple - but it won't be the last. This is a great way to dress up the less than pristine storage apples that are available this time of year. Yes, I was thinking the same thing. Great timing on this for using up apples that are starting to bruise. This sounds amazing Diane! I love apples in desserts, so I think this will be right up our alley. I truly hope you try it Adelina. You won't be disappointed. I'm so grateful to you for the melon baller tip. It made life A LOT easier. These apples were so, so good! My husband thought of it... and I was ready to get rid of it for being a unitasker. We also enjoyed these! Maybe next time I'll try orange juice. I don't always have cider in the fridge. It was really good... but I love anything with a citrus note in the winter. I like that you used orange juice for the liquid. It would be a nice bright touch to these. Your apples look beautiful! Thanks Renee... yes, it really worked. Your apples look wonderful! Glad these were a hit at your house. The orange juice sounds like a very nice addition. I used water with the honey and butter…they came out great! This was a winner for me too! Have a great weekend, Diane! Good to know that water works well. The stuffing is so flavorful I'm not surprised. I agree I never had fruit and especially nuts in baked apples. Really made it special. This is one of my favorite desserts :) they look amazing! This is baked apples on steroids... really out of this world. Haha...I bet those WW baked apples were a bit light on butter :) Yours look great, my friend! My mother probably put margarine on them it wast the 1970's. looking forward to the next dessert recipe, Paris/Brest. Hopefully, it will not be too difficult. I used straight orange juice it didn't seem over powering. I have a not so secret sou chief who helps with will the baking, my 12 year old daughter. I'm sure it won't be difficult for her. Whoops, I erased my comment so will try again. Third time. Charm? I also wonder why Dorie had us throw the peels into the pan. Probably won't do that next time. I wish I had sorted the melon baller out of my messy utensil drawer because your apples looked so lovely. I don't think many of us got our baked apples to the "spoon tender" place. I needed a spoon, knife and fork for mine. After 75minutes, I wanted to eat it - the smell was wonderful. Dorie's recipe was also not like I remembered baked apples from my youth. Perhaps it was the honey and butter, for one. Thanks for the oj suggestion. I don't usually have apple cider on hand but I do have oj and I will make these again. Oh, I hate how unprepared for cooking rental house can be. I have completely reorganized kitchens because I was so frustrated in how things were put away... good luck finding a melon baller or even a decent frying pan. Yes, yes use OJ it really had a wonderful flavor. Yes, good point, Mary...forgot about that, the peels in the pan thing. I didn't have that much "juice" that it needed the peels for extra flavor. Did you use them, Diane? Orange juice sounds like a great cooking liquid for this. I just used water this time and I think the apple peels did help the cooking liquid along - hard to say. I'll be making these again, too. They were delicious. The peels are probably important if you are using water but I am going to continue with OJ and I just found they got in the way when I was trying to bast the apples. My husband eats all my nuts too. I'm so glad I shared the melon baller idea... I guess everyone had the same trouble I had. Such a bummer about the vinegar, but it was completely understandable we all fill in with our minds what is the most common conclusion. Glad to hear you will be attempting it again. Citrus is the best flavor brightener, isn't it? I love cinnamon and orange together, so I can definitely see why you liked with this recipe. I am also grateful for the melon baller trick. Yay for French Wednesdays! I guess it is good that for everyone else that I have to make my dish early because of my food party. But I will remember (thank you Trevor) not to post it on FB until Friday, but I will put results in P and Q and on FB. Silly WW. Isn't a really good baked apple w/dried fruit (horrors!) and a pat of butter (and a scoop of ice cream) so much more satisfying?? :) Beautiful! Yeah, but I respect Weight Watchers at least they teach people how to eat instead of how to deprive themselves like so many diets do. Good for you jumping in with orange juice. I may have panicked. :) My mom did a bunch of weight watchers as well but I don't remember baked apples. Maybe she didn't find the WW apples all that appealing. They were definitely nothing close to these. I love baked apples unfortunately I did not get the chance to bake them this week but I will make this recipe for sure in the near future! I love how vibrant and appetizing the stuffing in your apples looks!!! 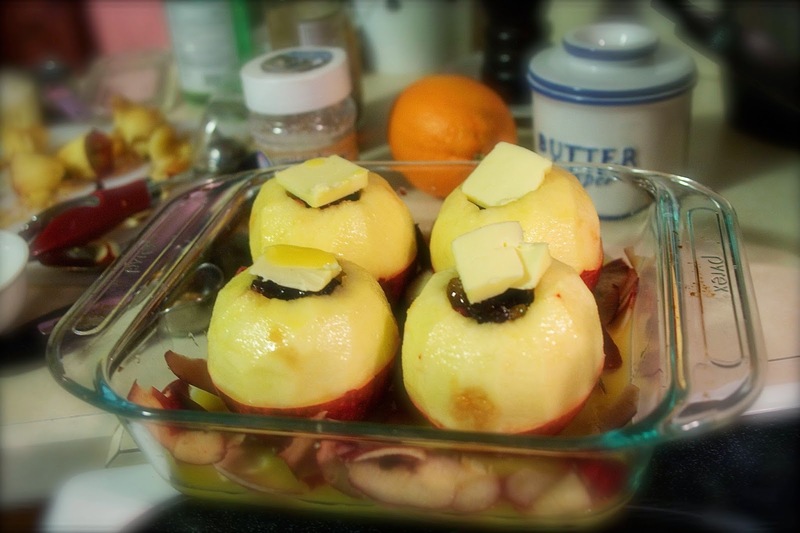 If you are already a fan of baked apples you are going to love this recipe. LOL - nope, these were definitely better than WW apples. Yours have such a lovely colour on top. Thats I put more butter on top than you were suppose too. They look fabulous. I am going to try them with ice cream next time. That photo has me salivating. Thanks so much... I couldn't believe I got the photo before the ice cream melted. It was delicious. This look wonderful. I think that I will try them this weekend. You'll enjoy both the smell and the taste. Great dessert. I love the simplicity of the recipe. I would want to top it with a touch of heavy cream or a drizzle of caramel sauce. I am stopping by from the In and Out of the Kitchen Link Party. I love your topping ideas thanks for visiting Nicky. You are very welcome. thanks for checking out my post. These look delicious! Wouldn't have thought of using orange juice, but now I want to try it. Thanks for linking to the In and Out of the Kitchen Link Party. Hope to see you next week. I lucked out the OJ worked. I just did a post a week or so ago about baked apples. They are one of my favorites as I grew up with Mama baking apples often. I bake mine now in the mircowave and it is fast...and they are delicious. I leave the peeling on mine, fill the hollowed apple with either red hot candies (sugar and cinnamon in one) or sugar, cinnamon and butter. Brown sugar is my choice. Someone told me about microwaving them part of the way. Interesting that you completely cook them in the microwave. They are such a delicious and healthy dessert. I wholeheartedly agree that some of the best recipes come out of having to make unexpected substitutions. While these apples might not be Weight Watcher approved, they were definitely healthier than many of the desserts I've (over)indulged in lately. I liked them OK, though not my very favorite kind of dessert. I would say these are pretty healthy too and so much more tasty than the Weight Watcher ones of my youth. Do you really label things "for cooking"? That's too funny. I usually try to hide things that I have plans for, but it doesn't always work! Thanks for the melon baller suggestion. I think I "need" to buy one of those. Wait until you have teenagers in the house... you'll be putting death threats on ingredients just to keep enough food in the house to make dinner... it's crazy how much they eat. I love baked apples and the filling for your baked apples looks really good, I can almost taste these. I need to make some baked apples! Thank you so much for helping us celebrate Three Years at Full Plate Thursday. Have a great week and come back soon! I could easily image your house being filled with the smell of baking apples. These are not the baked apples of my youth either - but I loved these! I initially was a little put off by the cooking time and basting, but the end result totally made it worth it! Exactly how I felt...but I will bast and make these again... especially if I get a large bag of apples in the Fall.